Counting gifts with Ann over at a holy experience dot com. This is a beautiful way to start a Monday. A day of new mercies. Before counting gifts, and there are many, I want to express my gratitude to readers. Thank you that you are here. Thank you for your encouragement. You bless me with your feedback. I look over my shoulder and see and hear you there, on this journey. I am praying for each of you, may His grace mark your day with a deep groove of the holy on this day in the midst of May. May the landscape of your life be touched by His Mercy, in the joy, in the hard, in the soft, and in the muck. In the mundane middles, in the fresh new starts, and in crossing the finish lines. Looking down the bridge of this nose on this face and counting the right smack here gifts in this very messy living. This life. The one with the bumps and the bruises, the turns and twists, the highs and the lows, the peaks and valleys and the ebbs and flows. The gifts are underfoot and might even get stepped on if we don’t step lightly and walk softly through the very messy living. 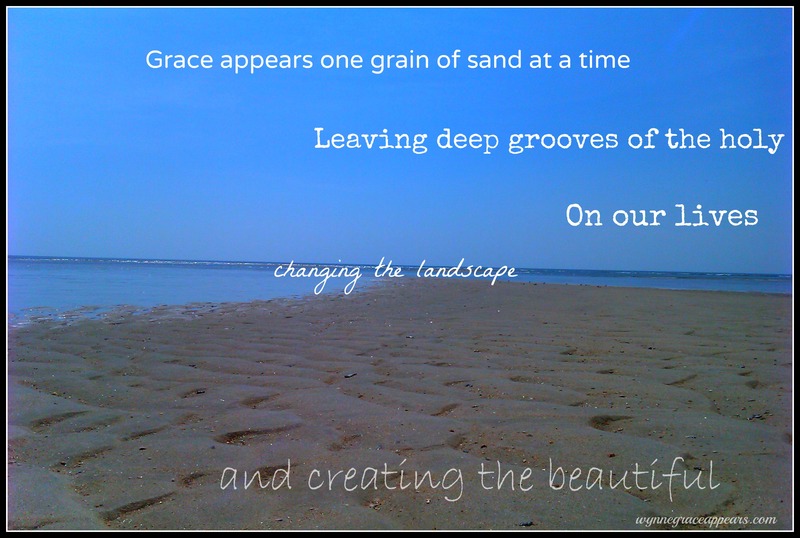 Our favorite worship song in church yesterday led by beautiful voices and an elbow in the rib from sweet girl of mine, followed by her singing loudly her praises….grace IS an ocean….. Going to take home communion yesterday as a trainee –shifting the lense of life and seeing the bread and the wine bless one who is bound by a wheelchair. Such wonderful amazing, moment-by-moment grace! His new mercies are eagerly welcomed every morning! Such a beautiful post, Elizabeth! You have encouraged me this day, on my journey! Nice to visit you here from Katie’s page. So enjoy your site. You’ve certainly ‘made an impression’! I’ll be following! Enjoy the day, and all the blessings it holds! Your words are a balm on my spirit today. Such kind words of encouragement. Your visit here today was a gift. Thank you for visiting here and for leaving the gift of words. I am grateful. You are welcome back anytime!!! Will look forward to having you back. I could not believe it when I saw Rob’s prom pictures on facebook. So proud of him!!! I love your hopefully messages…thanks for sharing!